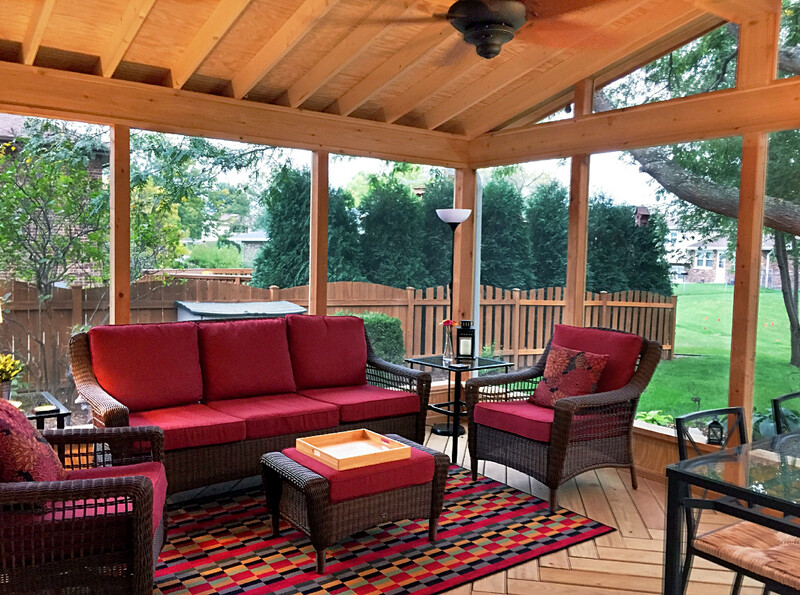 Truly a room with a view, this Downer’s Grove screened porch is special from any angle. From the herringbone decking pattern of the floor to the low gable roof and everything in between, this porch is designed to ensure a great view no matter if you look up, down, or out to the yard. One of the benefits of a custom room is the ability to customize to fit your needs. Like most screened porch customers, these homeowners wanted to maximize every single bit of the view of their yard. These screened openings are generously wide to fit that requirement. Take a look at the low knee walls on the screened walls. Code required a wall or railing but only a low barrier. To ensure we maximized every inch of the view, we created a low knee wall to meet code and preserve the view too. The slightly vaulted ceiling is an open rafter ceiling. Lending itself to the informal sensibility of this porch, the open rafters create a rustic but still custom feeling for this porch. Whether stealing a nap on the sofa or enjoying conversation among friends, the view from every angle is just delightful.